Mineral wool is a fire-resistant, non-combustible insulation product with superior sound abatement qualities. Its water repellant characteristics drain water away, making it exceptionally water resistant and vapor permeable. If you’re looking for a product that offers exceptional sound abatement, thermal protection and moisture defense, mineral wool is ideal for your next job. A variety of thicknesses and custom densities are available to suit your building needs. 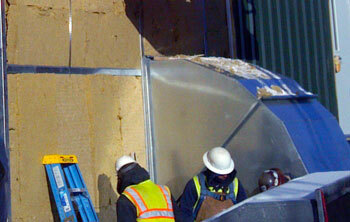 Contact your Therm-All representative or email info@therm-all.com for more information about mineral wool insulation.